Elizabeth died at an early age. The following obituary was printed in the Gonzales Inquirer. 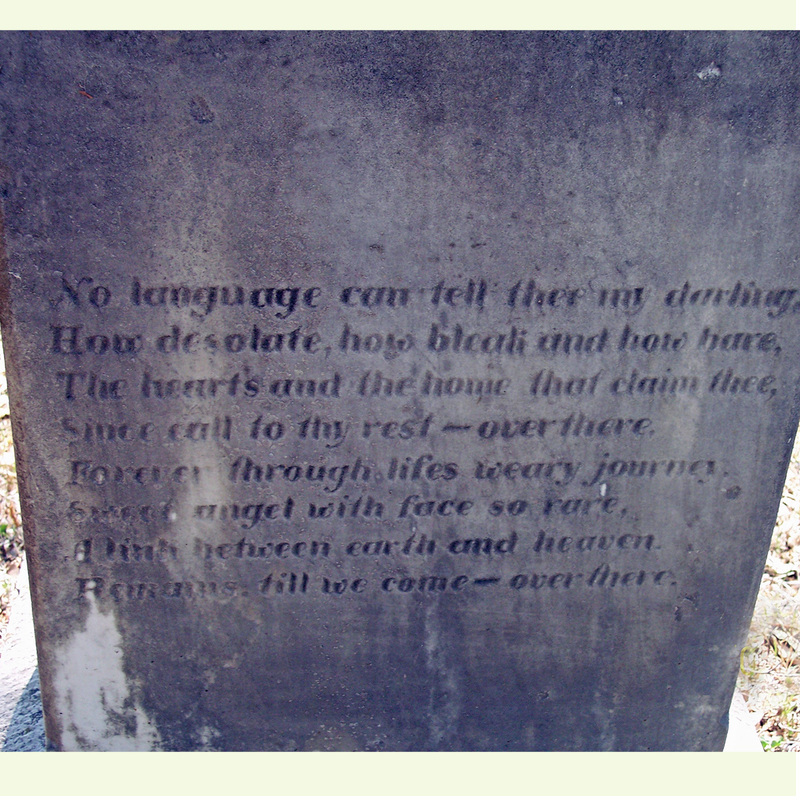 The family loved Elizabeth and expressed it with this sweet poem found on the back of her headstone. Since call to thy rest over there. Forever through lifes weary journey. Remains till we come over there. Relatives here received a message this morning conveying the sad news of the death of Brower Broer, one of the old time residents of Gonzales, who passed away Tuesday night at the home of his son, John Broer, at Ross, near Waco. Mr. Broer who had been in failing health for the past several years left here nearly two years ago to live with his sons, leasing his farm on the Waelder highway where he had lived for years. His wife who was formerly Miss Elizabeth Doretta Lipps passed away years ago. A daughter, Miss Laura May Broer, also preced him in death. He was an old trail driver, going up the trail several times, making the trip up into Nebraska sometimes with herds, from here. He was also one of the pioneer freighters of Texas, making a number of trips over into Mexico as well as frequent trips between Gonzales and the old port of Indianola, then an important port of entry for supplies. Mr. Broer was a member of the Christian Church of Gonzales for many years, having early professed his faith in Christ. He was reared in a godly home, his parents having been deeply religious, and his christain training was abundantly evident in his life, his relation with his fellowman and in his home. Mr. Broer had numbers of old friends over this section who will genuinely regret to learn of his passing. The remains will be brought here for burial, arriving in Gonzales tomorrow and the funeral will be held tomorrow afternoon under the direction of Kleine Brothers, undertakers, with burial ceremonies conducted by the I.O.O.F Lodge. Ladora who was also called Dora was born in September 1879 in Gonzales, Gonzales, Texas.26 She was a music teacher in 1900 living with her family in Gonzales. She married J. Allen Hancock about 1906.27 In 1910 J. Allen is a carpenter and their first child is born, Dow W. Hancock. They are living in Snyder, Scurry, Texas.28 It is believed he died January 1983 in Amarillo, Potter, Texas. 29 During the next 10 years, two more children are born. Dorothy L. Hanock was born in Texas in 1910 and Joyce C. Hancock was born in Texas in 1914. The family is living in Brown County, Texas. John Henry Broers, the fourth child of Doretta Elizabeth Lipps and Brower Broers was born 22 April 1890 in Gonzales, Gonzales, Texas.52 John Henry had several occupations during his life. He worked as a carpenter in 1910 while he was living with his sister, Dora Hancock in Scurry, Syndesr, Texas.53. In 1917 he was working as an electrician for the Houston Light and Power Company.54 and as a laborer in the oil fields.55 Later on he worked as an auto mechanic.56 He married Mae Sue Hale in 1923.57 They had one daughter, Mary Francis Broers who was born 3 Oct 1926 in ,Harris, Texas.58 Mary Francis married Donovan Lee Prince59 and had one son, Donovan Lee Prince II.60 Donovan Lee Prince I died 19 June 1997 in Pearland, Brazorio, Texas. 1. US Federal Census 1860; Dewitt, Texas; Roll: M653_1292; Page: 462; Image: 400. 2. US Federal Census 1870; Precinct 2, Dewitt, Texas; Roll: M593_1582; Page: 232; Image: 463. 3. Marva Hughes research marriage of Elizabeth Doretta Lipps and Brower Broer. 5. The Gonzales County Historical Commission, Gonzales County History, Curtis Media Corporation, F73, Page 233, Janice Hartman, 3367 S. Joshua Tree Lane, Gilbert, Arizona 85297. Compilation of History of Gonzales County and family histories. 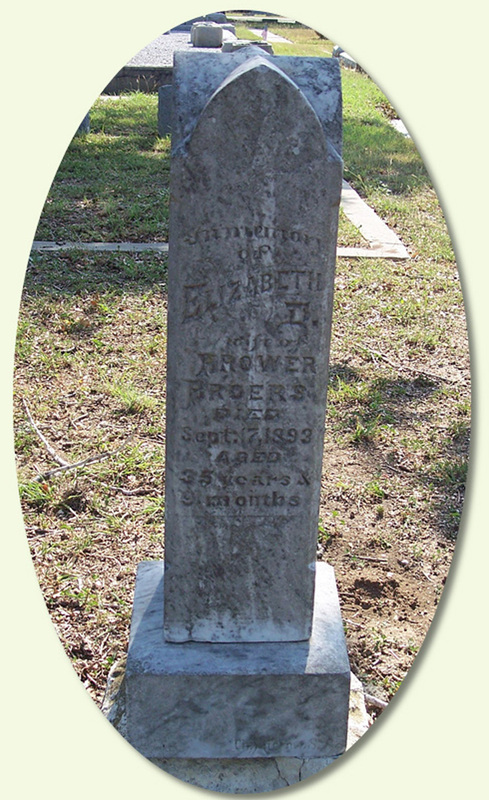 Brower, born April 24, 1849, married Elizabeth Doretta Lipps. 7. US Federal Census 1880; Gonzales, Gonzales, Texas; Roll: T9_1306; Family History Film: 1255306; Page: 379.2000; Enumeration District: 67. 8. US Federal Census 1880; Gonzales, Gonzales, Texas; Roll: T9_1306; Family History Film: 1255306; Page: 379.2000; Enumeration District: 67. 9. Broers, Schweer and Deepke, History of Gonzales County Texas, F73, Page 233 by Zella Broers Suche Giles. 12. Broers, Schweer and Deepke, History of Gonzales County Texas, F73, Page 233 by Zella Broers Suche Giles. 13. Gonzales Inquirer: Broer, Brower, Old Trail Drivers Reunion, 12 May 1923. 14. US Federal Census 1880; Gonzales, Gonzales, Texas; Roll: T9_1306; Family History Film: 1255306; Page: 379.2000; Enumeration District: 67. 16. US Federal 1900 Texas, Gonzales, Family Records: Broers, Laura May Birth, Web Site, Gonzales, Gonzales, Texas; Roll: T623 1638; Page: 30B; Enumeration District: 51., 29 Jun 1900, Ancestry, www.ancestery. com. 17. World War I Draft Registration, 1917-1918, Family Records: Broers, Martin Earnest Birth, Web Site, Roll: 1983381 , 5 Jun 1917, Ancestry, www.ancestry.com. 18. World War I Draft Registration Cards, 1917-1918, Family Records: Broers, John Henry Birth, Web Site, Roll 195356343-3-23A, 5 Jun 1917, Ancestry, www.ancestry.com. 19. http://www.oftimeandtheriver.org/misc/glossary/glossary2.htm Crysipelas. A contagious disease known since the Middle Ages. The name “crysipelas” was applied to a multitude of conditions (including shingles) in which the skin was reddened and inflamed. Hence, its more colorful names like “holy fire”, “St. Anthony’s Fire”, “rose-in-the-leg”, and “black-tongue”. Often written as “crysipelas” in early historical accounts, the name commonly used now is erysipelas. There is an erysipelas that infects turkey and swine, but it is caused by different bacteria. Hog cholera (swine fever) is also called erysipelas. Through modern medicine, we know that erysipelas in humans is caused by various streptococci bacteria, which infect the skin and spread through the lymph system. Once far more common than now, the incidence of erysipelas/crysipelas among humans has probably declined due to the improved sanitation and the use of antibiotics. 20.Gonzales Inquirer, Kathleen Springs Transcriptions at Gonzales Archives. This file contains 5 Jan 1893-28 Dec 1893 Broers, Doretta, Elizabeth, Mrs., died Gonz. Inq. 21 Sep 1893. 21. US Federal Census 1900; Gonzales, Gonzales, Texas; Roll: T623 1638; Page: 30B; Enumeration District: 51. 23. US Federal Census 1910: Justice Precinct 1, Gonzales, Texas; Roll: T624_1556; Page: 18A; Enumeration District: 83; Image: 104. 24. US Federal Census 1920:Justice Precinct 1, Gonzales, Texas; Roll: T625_1807; Page: 4B; Enumeration District: 83; Image: 601. 26. US Federal Census 1880; Gonzales, Gonzales, Texas; Roll: T9_1306; Family History Film: 1255306; Page: 379.2000; Enumeration District: 67. 27. US Federal Census 1910: Snyder, Scurry, Texas; Roll: T624_1588; Page: 9B; Enumeration District: 230; Image: 53. 29. Social Security Death Index; DOW HANCOCK 04 Jul 1905 - Jan 1983 79107; Amarillo, Potter, TX 79107 466-16-0220. 30. World War I Draft Registration: Potter County, Texas; Roll: 1983578; Draft Board: 0. 31. Gonzales Records Center and Archives, marriage licenses 1829 through 1948. Rootsweb.com; Broer, C.O. and Josie Mangum - 08/24/1911 - #10200. 32. Ancestry One World Tree; Josephine Jodie Mangum. 33. Gonzales Record Center and Archives, P.O.Box 77, Gonzales, Texas 78629; Odd Fellows Gonzales Cemetery. 34. Gonzales Daily Inquirer: Kathleen Springs Transcriptions at Gonzales Archives for 2 Jan 1901-31 Dec 1901; Broers, Laura Mae, died, Vol. 5 No. 136 Daily Inq. 6 Nov 1901. 35. World War I Draft Registration: Roll: 1983381 , 5 Jun 1917, Ancestry, www.ancestry.com. 36. Texas State Department of Vital Statistics, Coleman, Rose Catherine, Web Site, Registrar #13484, Family Search Labs, http://search.labs.familysearch.org/recordsearch. 37. US Federal Census 1920; San Jacinto, Texas; Precinct 1; Roll T625_1844; Page: 12A; Enumberation District 132; Image 43. 38. US Federal Census 1930; Cleveland, Liberty, Texas; Roll: 2370; Page: 7B; Enumeration District: 10; Image 808.0. 39. Texas State Dept of Vital Records, Registrar #4188, Family Search Labs. 41. Cleveland Advocate, Cleveland, Texas, 21 January 2004, Ancestry, http://www.ancestry.com/search/obit/. 43. Texas Birth Index, 1903-1997; Martin Joe Matlock, 27 June 1949, Libert County Texas; Roll Number 1949_0008. 44. Texas Marriage Collection, Martin Je Matlock and Virginia Stripling; 1966-2002 Roll Number: 1948-0012. 45. Texas Birth Index, 1903-1997, Brian Todd Matlock; 24 January 1975; ,Harris, Texas; Roll Number: 1975_0009. 46. Ibid;Brad Steven Matlock; 2 April 1981; ,Harris, Texas; Roll Number: 1981_0012. 47. Cleveland Advocate, Cleveland, Texas, 21 January 2004, Ancestry, http://www.ancestry.com/search/otit/. 48. Texas Birth Index, 1903-1997; Rosemary Matlock; Roll Number: 1942-0006, Ancestry.com. 49. Texas Divorce Index, 1968-2002, Marriage Rosemary Matlock and James Alexander Grimmet 26 July 1963; Divorce 2 September 1976. 50. Texas Birth Index, 1903-1997, Jenifer Adriane 9 September 1972, Harris, Texas; Roll Number : 1972-0006. 51. Texas Marriage Collection, 1966-1997, Jeneifer Adriane and William I Traverner; 22 April 1995; ,Harris, Texas. 52. Word War I Draft Registration Cards, 1917-1918, John Henry Broers; Roll 195356343-3-23A, 5 June 1917. 53. 1910 census 54. Draft record 55. 1920 census 56. US Federal 1930: Texas, San Jacinto; Precinct 2; Roll: 2389; Page: 3B; Enumeration District: 4; Image: 76.0; 17 Apr 1930; Ancestry.com. 58. Harris County Texas-Births, 1926 Surnames: Abell - Carroll; Information in this database comes from the Texas Department of Health. As of March 2000, Birth Indexes from 1926-1995 and Death indexes from 1964-1998 are available on the internet, microfiche or CD-ROM; http://www.tdh.state.tx.us/bvs/registar/index.htm. 59. Texas Birth Index, 1903-1997; mother's name: Mary Frances Broer; father's name Donavan Lee Prince; Roll: 1954_0012. 61. Social Security Death Index Record: John Broer; SSN: 462-78-7626; Last Residence: 77581 Pearland, Brazoria, Texas: Died: November 1979.